The Great Escape	From 1 day & 1 night. 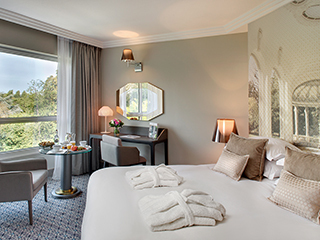 Care treatments à la carte: in addition to your weekend spa package, book some treatments à la carte (massages, beauty care treatments from Vichy Laboratories Institute or from SkinCeuticals, dietetic consultation, aquasport,...). PRICE PER PERSON AVAILABLE FOR 2019. Best price guaranteed: 1 day & 1 night. From €157 per person per day. Thermal Spa Pass + Deluxe Thermal Spa view room (2 people minimum) and Half board. Our prices include sales tax and exclude tourist tax (€2.50 per day and per person) and extra treatments and services, upon availabilities.